The mystery surrounding Professor Nettleforth's disappearance is solved when the professor's remains turn up in the backyard of his former home. It appears he was strangled and eaten by his own houseplant, a fact so bizarre that Frogmore is once again inundated with reporters. At school a new boy, Damien Berkinshaw, is showing a nosy interest in Rodney's ability to fade. Damien pursues Rodney to obtain photographic evidence, a relentless pursuit that results in several accidents. In Llandringodd, the rule of law has broken down. The opportunistic Rafferty has taken advantage of the country's environmental crisis and is making himself rich at Llandringoddians' expense. He's also depriving political opponents of their liberty. Amongst his prisoners are Chief Inspector Fox, DS Hound, Mr McTavish, Remus, Mrs Strangeways and Evelyn. Can Rodney rescue the two policemen and his friends? Can he help bring about Rafferty's downfall? Wendy had two stories published by Lothian Children's Books, The Doolally Kid (2005) and The Boy Who Disappeared (2006). When these books were originally published they received excellent reviews and the former found its way into schools. After Lothian was taken over, Wendy decided to self publish. The venture commenced with Angel of Fire (2013). Four sequels have now been released: Sophies Return (2014), Nemesis (2014), Spooks (2015) and Finding Cathcart (2015). In 2015 Wendy also republished The Doolally Kid and in 2016 The Boy Who Disappeared. 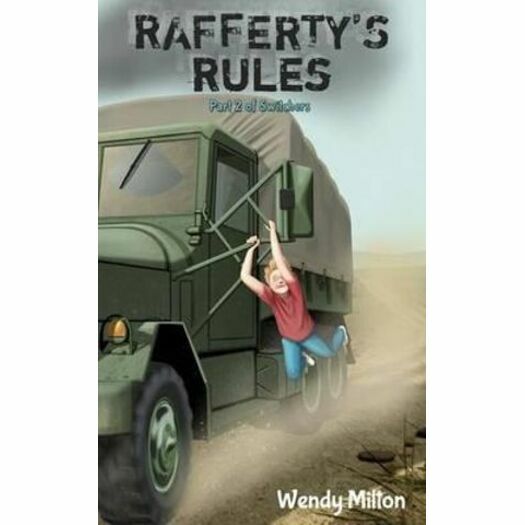 The latter is now Part 1 of Switchers, to which Wendy has added Part 2, Rafferty's Rules. Also released in 2016 is The Enchanted Urn, a tale of a boy's encounter with a very different dog. Wendy graduated from the University of Newcastle and went on to complete a Master of Arts degree at the University of Sydney. She taught HSC English at Newcastle Grammar School until 1983, in which year she left to live and work in Sydney. Currently living in Rozelle, she's written eleven children's books, six of which are on the market. The 2017 releases will bring this total to nine. Wendy plans to publish two more books next year.